Author(s): Marlene Koch, R.D., L.D. 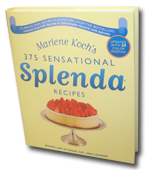 Plan healthy and delicious meals with Marlene Koch’s best-selling diabetes-friendly cookbooks. Marlene is a registered dietitian whose cookbooks and recipes have been featured on television, websites and in magazines. 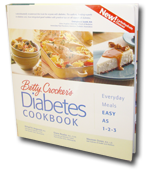 ADW Diabetes also carries a range of other diabetic cookbooks. Author(s): Richard M. Bergenstal, M.D. ; et al. Here’s the good news. A diet that’s healthy for diabetics is healthy for all the rest of us, too! 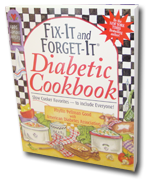 Fix-It and Forget-It Diabetic Cookbook is packed with delicious recipes for everyone -- including those who have to keep track of food exchanges, carbohydrates, sugars, calories, and fats. This cookbook makes mealtime an occasion when everyone belongs. No one has to pass up a dish when the recipes come from this new cookbook in the much-loved Fix-It and Forget-It slow-cooker series. 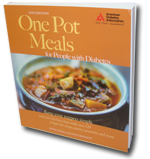 Revised and better than ever, One Pot Meals for People with Diabetes is your solution to delicious meals in a snap. Nothing is easier than "one-pot" cooking prepare your ingredients, combine, and let them cook! And with recipes that cover everything from pasta to casseroles to hearty sandwiches, you've got options for any appetite. Low-carb eating continues to gain adherents as people discover that they can lose weight and help manage chronic conditions such as diabetes and high cholesterol by eating more low-carb foods. 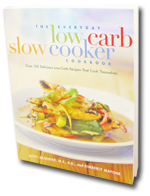 Everyday Low Carb Cooking — here in its third edition — contains 225 recipes from two dozen cuisines that provide a wide variety of low-carb options.